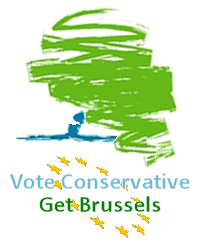 David Cameron and other Conservative MPs keep telling us that we must all vote Tory at the next election because that's the only way we will get an in/out referendum on our membership of the EU. It's time the truth was told. David Cameron has promised a referendum (like he did with the Lisbon Treaty) on our membership of the EU in 2017 if he wins the next election - which he won't - and it will be an in/in/out referendum, not an in/out referendum with all three of the LibLabCon parties using all the power and resources of the state to campaign for an "in" vote. Three options will be presented in this mythical referendum - stay in as we are now, stay in with some meaningless "concessions" or leave. This is because it is human nature to choose the "safe" option which is what the reform option will be presented as even though it is equally dangerous as the status quo option because there will be no other vote for at least a generation. 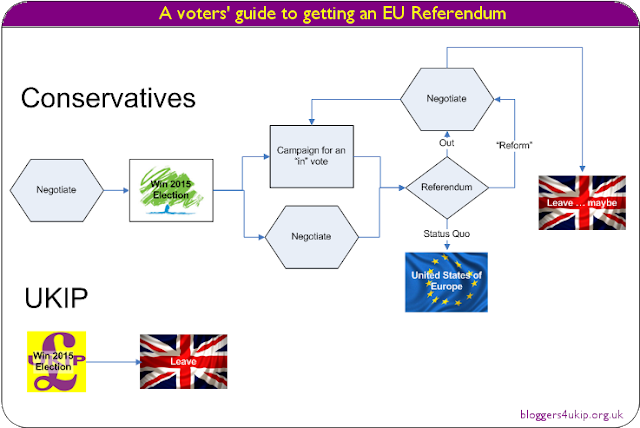 Under Cameron's policy of a 2017 referendum the "negotiations" that have already started will continue until 2017 assuming the Conservatives manage to form a government after the routing they're going to get in 2015. A deal will be done to give the illusion of repatriating power from the EU whilst in reality repatriating no powers as there is no legal basis under EU law to do so. We will have a referendum some time in 2017 and if the electorate votes to leave then the provisions under Article 50 of the Lisbon Treaty will be invoked which means a further two years of negotiations to try and find a way of keeping us in and in all likelihood a further referendum or suspension of the referendum result whilst negotiations continue. At best we might see an exit from the EU in 2020 if no barriers are put in the way. In reality it is likely to be at least a decade from now, if not longer. Contrast that with UKIP's policy which is vote UKIP, leave the EU. Whether we do so via Article 50 and we're out after two years or whether we just stuck two fingers up to the EU and leave when we want is something that would need to be decided at the time but two years is realistically the longest we would have to wait to leave under a UKIP government. So we know whose policy will get us out of the EU quickest and with the least disruption and uncertainty and of course we know who can be trusted most out of Cameron and Farage but who is in the best position to deliver the referendum we need? If you listen to Cameron it's the Tories but they're not going to win the next election and they're not capable of attracting large enough numbers of Labour, Lib Dem and traditional non-voters to make up for their rapidly draining support. The Lib Dems will be lucky to survive the next election with any of their MPs left and Labour are absolutely opposed to an EU referendum. Only UKIP attracts votes from traditional Conservative, Labour and Lib Dem voters as well people who've never voted before, people who haven't voted for years and of course traditional UKIP voters. UKIP is the only party with broad enough support to win the next election outright and stop the inevitable Labour victory but only if the Tories stop splitting the UKIP vote. Voting Conservative at the next election will let Labour win and we won't get an EU referendum, voting UKIP will let UKIP win and we'll be out.